I used rhythm cards like these just about every lesson when I taught elementary general music. I think they will come in handy for piano teachers as well. None of the cards are duplicated, so you will have a good stack of rhythms when you are done. To use less paper, print on the front and back of a heavy card stock. I used these as just basic flashcards, where I held up a card and the students claped it or played the rhythm on a percussion instrument. Once they were secure at reading the rhythms, I would show them the 1st card for 4 beats, then have them clap the rhythm as I show them the next flashcard. This takes a lot of focus, but the students loved it when they realized they could do it! I also used these for Rhythm Tic-Tac-Toe, having students identify which of several rhythms was clapped, and all sorts of other games and activities. Set 1 includes Quarter Notes, Quarter Rests, and 8th Notes. These were my staple in Kindergarten and first grade classes. Set 2 is perfect for the Primer – Level 1 piano student. It contains quarter, half, dotted half and whole notes, and quarter, half, and whole rests. Set 3 has eighth, quarter, half, and dotted half notes, as well as quarter and half rests. Every card includes 8th notes. Rhythm Cards Set 4 This set has 16 notes, as well as various 16th, 8th, and dotted 8th note combinations. Rhythm Cards Set 5 This set has dotted quarter/8th note combinations. What program do you use to make the rhythm cards? I can’t find anything to make notes and other notation. Sally, I just wrote a post to answer your question. Go to the top of the page and click on the green Home tag and you should see it. The short answer, though, are 2 font sets sold by http://www.macmusicfonts.com. Well worth the $41! Great blog, D’Net! Thanks for including so many downloads that have such practical application! Do these music fonts include 16th notes? Though I dont normally introduce 16th notes to beginners, however I do occasionally need them. Would you consider making a set that includes 16th notes? I just printed off all these sets of rhythm flashcards and am planning to use them for my piano camps next week! 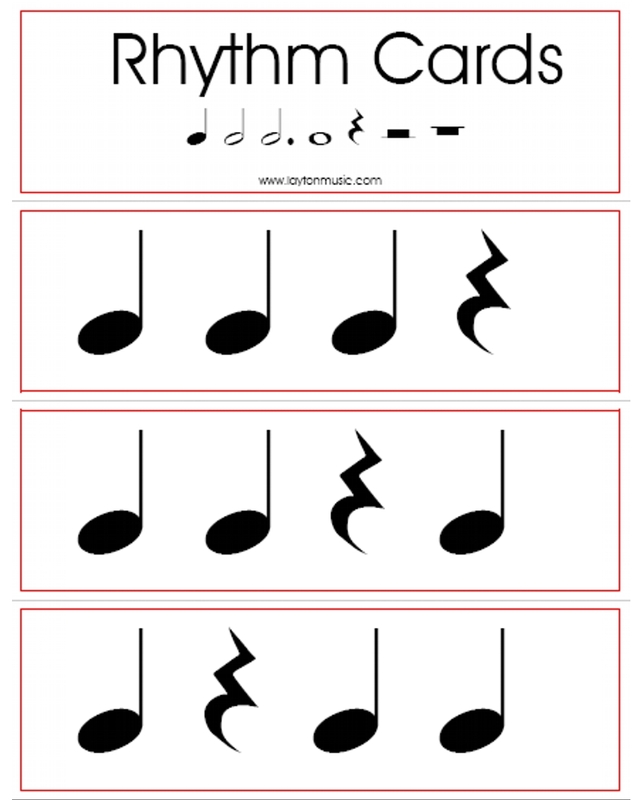 If you ever decide to make more rhythm cards available, I would sure love to have some that incorporate a dotted quarter followed by eighth note since that seems to be an especially difficult one for students to grasp. Your wish is my command, Natalie! Just did up 15 dotted quarter/8th note combinations in Rhythm Set 5. Don’t know why I didn’t think of that earlier! Hey D’Net, your materials are awesome. Thanks so much for sharing them. Do you have any plans to create 2 measure rhythm pattern cards? I would be very interested in something like this but with basic rhythms like quarter, half, whole, dotted half, rests in both 4/4 and 3/4 time signatures. If you’re considering something along this line please let me know. Thanks so much. Would you consider making a set of rhythm flashcards that include triplets? I just printed set #5 – I use the other sets with my students. Thanks again for all of your superb materials! Are there sets of rhythm cards in 3/4 time? Maybe I just missed them on the site. Thank you. I am a new piano teacher and just love this site!!! you guys are so creative and have such good hands on learning ideas. I love it! Keep them coming! And maybe someday I will have to time to come up with some of my own to share!!! Thanks again, you guys are a lifesaver! Just to add one thing – I’ve been taking a laptop into lessons the last couple of years. Apart from helping me organise myself (registeres etc.) some students love reading the PDF’s off the screen. Anything with a computer seems to turn them on more than traditional methods somehow…..
What a great idea, Jon! I think I will try that. I have volunteered to direct the children’s choir at my church and feel like such a fish out of water. These cards are like a Godsend. Thank you so much for having these available. These are so great! Would it be possible to add 6/8 Rhythm Cards? These are awesome!! My dd6 will be graduating from Kindermusik next month and I am trying to decide what to do next. Until I decide, I need to have something to keep her skills sharp- thank you thank you thank you for providing that for me! We tried out the rhythm cards today- and she LOVES them!! Thanks again! Thank you! These are great to use for a college student that needs too see a whole set of beats per bar at a time! I love it! Keep them coming! And maybe someday I will have to time to come up with some of my own to share!!! Thanks again, you guys are a lifesaver! Thank you for the flash cards! These are absolutely gorgeous. I am going to post a link to these flash cards on my orchestra’s website for my students to print out at home (and their parents as well!). Thank you for taking the time to do this. merci poste très instructif pour nous part! Thanks SO much! LOVE THE CARDS! I am not aware of the thing that there might be so many rhythms associated with the flash cards… They sonuds like some great way of fun… Could you tell me some more regarding these? I’m using your flashcards in my classroom and the students love it! I was wondering, though, if you could put out a set that had the syncope rhythm – eighth, quarter, eighth – in various combinations with quarter and eighth notes. That rhythm pattern comes up a lot for my grade four and five students and I don’t have a card for it. These are great and thanks for sharing them. You might want to revise set 5 though as some if the dots go across the middle of the bars and should be ties instead. Thanks for the flashcards, they are nice! Большое спасибо! Thanks a lot. These cards are great! Thank You for offering such great resources for free! These cards have been especially helpful in practicing fresh new rhythms (not just the ones we get in piano texts) with my little one! Any possibility you could make some in 6/8 time including 3-eighth notes, single eighth notes, dotted quarter notes and quarter notes? THANK YOU AGAIN! Your resources are so helpful, I use them in my music classroom! Have you posted new items recently? Thank you for the inspiration! Thank you so much for sharing these! Just downloaded to use to my kiddos! I can’t wait! Awesome. I can use these on my SmartBoard. Thank you! Thanks so much for these! I have been using them for a year or so and never run out of ways to use them. My students love them. Thank you! Thank you so much the look fantastic! might not presently visit if they’re more coupons friendly. Thank you very much for this material! thanks a lot for sharing this material! it’s awesome! Thanks for the cards. Both my students and I enjoy using them. Thank you for creating and sharing these handy cards! Thank you so much for these cards! I use them so often 🙂 thank you!!!!!!! Wonderful! Would it be alright if I shared this resource with other music teachers in my district (directing them to your website)? Also, would you be ok if I put these in a powerpoint and share them with my teachers (keeping your information attached to them)? I am so sorry I haven’t answered before now. Of course you may pass the information on, and feel free to use it in any presentations. Thank you! Thank you so much for sharing these card. It is awesome!